A word of caution to begin: The tube is very sensitive and a little of this product goes a loooonnnng way. The first couple of times I used this blush, I accidentally squirted out way too much, which made me look more flushed than blushed. That said, once I got the hang of it, I started to really like this product. A couple of dots are all you need for a light, natural looking blush. It's very she...read moreer, but definitely buildable, if you want more color. Though I like cream blushes for days when I'm too lazy to pick up a makeup brush and use a powder, I find it's not the best for my slightly oily skin -- and this was no exception, it wore off before the end of the day. 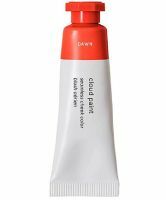 Glossier's cloud paint gives a lovely, very natural flush to the cheeks. The shades are gorgeous and the silicone-y consistency blends silkily into skin. You can definitely blend it in before it dries and the color is buildable. I find it tough to squeeze out the right amount from the tube and wish they were slightly more pigmented. But here it is eight hours after applying and my cheeks are still rosy. This blush is awesome! It goes on amazing, it does not have any shimmer to it.